Kazim is a member of the Brotherhood of the Cruciform Sword, a secret society dedicated to the protection of the Holy Grail and preventing it from being discovered and misused. When Indy and Elsa arrived in Venice in search of the Holy Grail, Kazim tried to kill them, until he learnt that Indy was only interested in looking for his missing Dad. Kazim then lets Indy and Elsa go, providing Indy with his Dad’s location. Kazim is another “dressed in suit with tie” figure, but the most complicated part in making a Kazim figure is that he wears a striped suit, one would need to paint the vertical stripes line by line onto the suit iin order to make the figure screen accurate. On the other hand, the James McCullen XXIV figure already wears a striped suit, and I realised that I can easily customise a Kazim figure by changing the head and making other slight alterations. The striped jacket came together with an internal vest, which I cut out. In the movie, the jacket was buttoned up most of the time. However, the figure’s jacket was too tight to be closed, so I left it opened. The shirt was repainted white, with the tie repainted light yellow. Kazim’s head was customised from that of a German soldier. Kazim wears a headwear called a fez, which was sculpted onto the head by using epoxy and pieces of plastic. 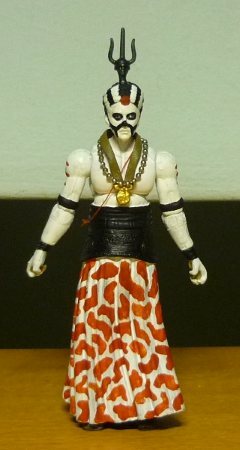 The figure was given a dark skin tone colour, with the moustache painted on the face. The last bit to be added was the red paper dot on the jacket, which serves as the flower deco. And with the completion of my latest Indy custom, I thought that I would take a snapshot of all my completed Indy customs thus far. Having customised so many figures, sometimes even I lose count of the number of figures that I had done. Here’s a pic, followed by a list. Imagine this as a reunion picture. Outside of this list are a couple of work in progress, as well as those still in the planning stages. We have an awesome “Temple of Doom” special here, with two custom Indy figures from that movie, plus something extra ! After Indy was caught trying to steal the Sankara Stones, he was made to drink a vile concoction, which placed him under the Black Sleep of Kali and made him think that he was a believer of the Thuggee cult. The Thuggee High Priest Mola Ram then instructs Indy to sacrifice Willie Scott to the Goddess of Death. One surprising difficulty that I faced when I was customising this particular Indy figure was transplanting the lower right arm from the Cairo Swordsman over to Anakin Skywalker’s right arm. Remember that in “Star Wars Episode II: Attack of the Clones” Count Dooku had cut off Anakin’s right hand, and it was replaced with an artificial hand. 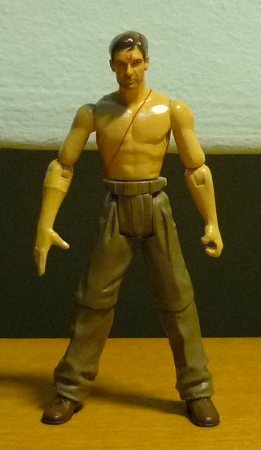 The bare-chested Anakin figure likewise came with a artificial right hand, which must be replaced with a normal one for my custom Indy. The most difficult part in doing this was in determining the appropiate length to cut the arm such that, after it was transplanted over, both the right and left arms would be equally long. And I figured out how to do this by using the distance from the elbow to the thumb as a benchmark. Making sure that this distance was the same on both arms ensured that both arms would be of equal length. If not, one arm would have looked longer than the other, which would have been a disaster. And being a stickler to details, I had added on the “U” symbol on Indy’s forehead, as well as several whip marks on Indy’s back. The whip marks are at exactly where they appeared in “Temple of Doom”. Following the conclusion of a human sacrifice to Kali, the Thuggee Acolytes bring forth the Sankara Stones and placed them upon the Thuggee altar. The Thuggee Acolytes operated the levers of the sacrificial mechanism, and they tried to stop Indy from saving Willie after Indy was freed from the Black Sleep of Kali. I had the bare-chested torso of the G.I. Joe figure Gung Ho, which I had acquired earlier when I was scouting for suitable parts for the German Mechanic. And when a Po Nudo went on clearance sale, I knew I can buy it to use its “skirt” to customise a Thuggee Acolyte. After I had attached the torso to the skirt, I was thinking of sculpting the waist wraparound by using epoxy alone, until I came up with a much easier short cut, by cutting out the wraparound from a spare Belloq’s skirt. and pasting it around the Acolyte’s waist, to cover over the joint between the torso and the skirt. I used the Monkey Man’s legs, although you can barely see it under the skirt. I had several Mutt William’s head around as spares, and with all that facial markings on the Acolyte no one should be able to recognise whose head it belonged to. The turban was transplanted over from the Monkey Man. And the headpiece was made from the head of a small plastic toy soldier that I had, with the horns and spike attached. You cannot believe how many items the Thuggee Acolyte wears around his neck, but I have placed the neckpieces in the correct order, with the red thread, the medal, and the beadpiece. There are supposed to be two medals and the beadpiece loops twice around the neck, but I decided to save myself the trouble. In “Indiana Jones and the Temple of Doom”, two versions of the Acolytes appear, one wearing a white skirt dotted with red markings, the other wears an all-red skirt. I chose to do the harder custom, although the red markings had no way of matching the onscreen appearance since it is almost impossible to see how the markings look like from the movie, and I had to use my imagination. “Indiana Jones and the Temple of Doom” gets a rather bad rap for having a considerably darker tone in its story. Nonetheless, I have created custom figures of characters from the movie, along with this special custom item: the awesome Thuggee altar ! The Thuggee altar with the Sankara Stones. The altar is flanked by Indy, Thuggee Acolyte, Thuggee Swordsman, and a Temple Guard. I did not actually go and create that skull, it was a souvenir that I had bought in LA Disneyland several years back. 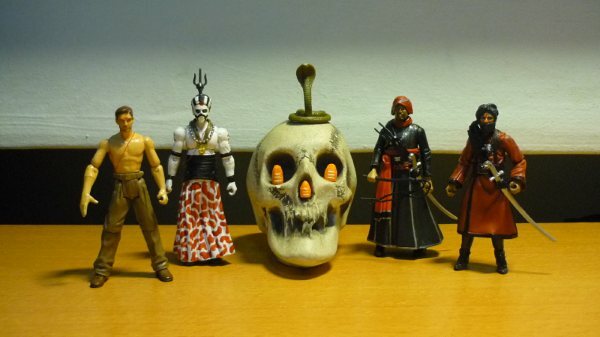 The Sankara Stones were made from styrofoam, while the cobra came with the Cobra Commander from “G.I. Joe: The Rise of Cobra”. After Indy was freed from the Thuggee influence, Indy defeats the Thuggee and recovers the Sankara Stones. He then decides to save the child slaves held in the mines. See if you can spot the goof in the movie which I had corrected for in this pic. 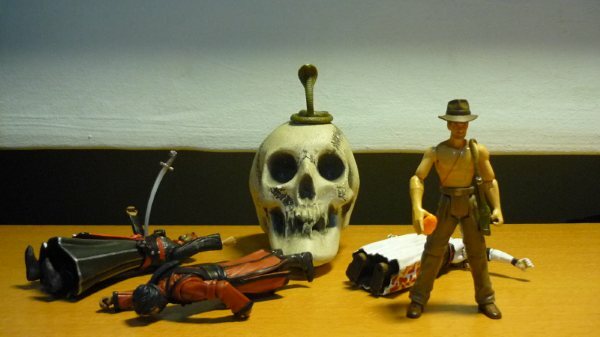 Here are two of my latest Indiana Jones custom figures ! The Nazis have obtained the Ark of the Covenant and transported it to their secret island base. 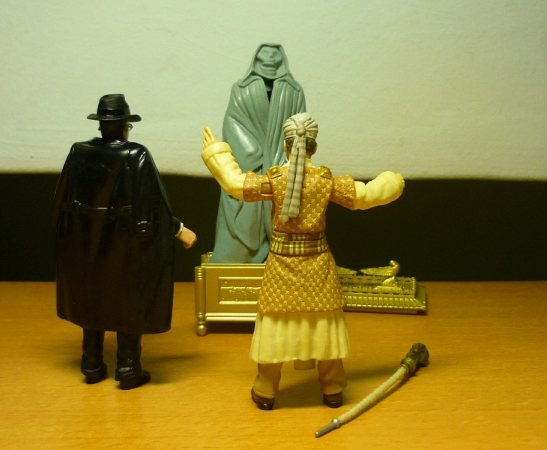 When Belloq performs an arcane ceremony to open the Ark and discover its contents, he incurs the wrath of God, for ghostly apparitions emerge from the Ark and they discharge God’s vengeance upon all who were present, save for Indy and Marion, for they had closed their eyes and kept their sights away from God’s fury. Apart from releasing Indiana Jones figures in 3 3/4″ size, Hasbro had also released a even smaller sized series of figures known as the Indiana Jones Adventure Heroes, they are roughly 1″ tall and were all sculpted with an emphasis on being cute. Almost all the figures, either good guys or bad, are smiling. And I figured that I can create a corresponding 3 3/4″ version for one of them, the Ark Ghost. And to do so was easy. 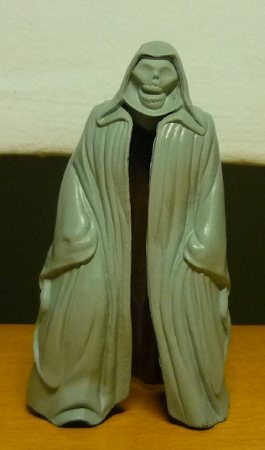 I cut out the head of a spare Ark Ghost, and trimed its sides so that it fit into the hood of Mace Windu’s cloak. I then superglued the Ghost face into place, and painted the whole thing light blue. And with that skull face, the Ark Ghost looks real scary. The Ark Ghost can be made to stand in the Ark, making it look as if it was emerging from the Ark. The fury of God descends upon those who transgress upon his authority. The Ark Ghost scares the living daylights out of Toht and Belloq, and the Ark’s power totally destroys them, with Toht’s face melting away, and Belloq’s head bursting into flames. When Indy was caught sneaking around the mines of Pankot Palace, the Maharaja tortures Indy with a voodoo doll. Short Round tries to stop the Maharaja by kicking at him, and the Maharaja retaliates by borrowing a whip from the Thuggee Swordsman and whipping Short Round. The Thuggee Swordsman also serves as the Maharaja’s bodyguard by escorting him away when Indy later fights with the other Thuggees while trying to rescue Willie from being sacrificed. This figure has bits and pieces from all over the place. Mace Windu’s torso and arms were leftovers after I had used Windu’s head for Katanga and his legs for Sophia Hapgood, while the stuff from the Chief Temple Guard were leftovers after I had made the German Mechanic. The same story probably goes for all the other parts. It was rather fun to be able to combine whatever spares that I have to create an all new figure, since I am clearing the space occupied by my spares. 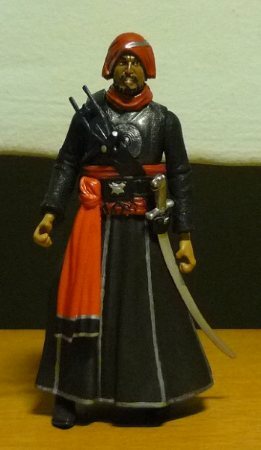 I named the figure “Thuggee Swordsman” since his face is exactly the same as that of the Cairo Swordsman, and that he has a sword as well. The Thuggee Swordsman is one of the many background characters in TOD. 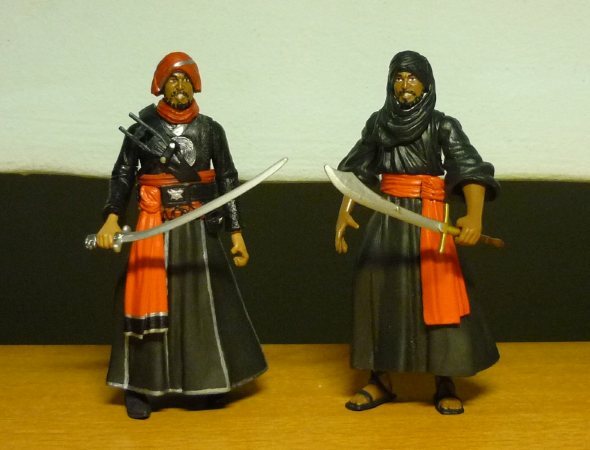 Thuggee Swordsman, and Cairo Swordsman.